Scotland will remain part of the United Kingdom -- along with England, Wales and Northern Ireland -- following a historic referendum vote. 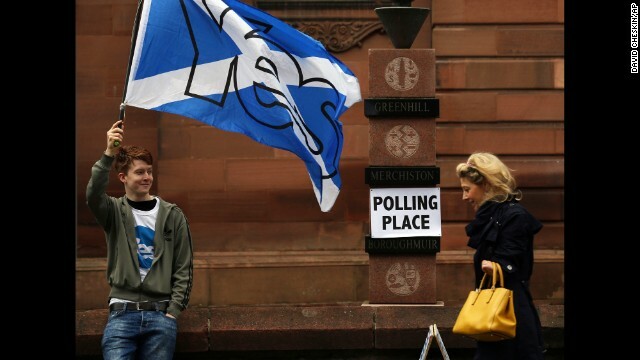 A majority of voters rejected the possibility of Scotland breaking away and becoming an independent nation. 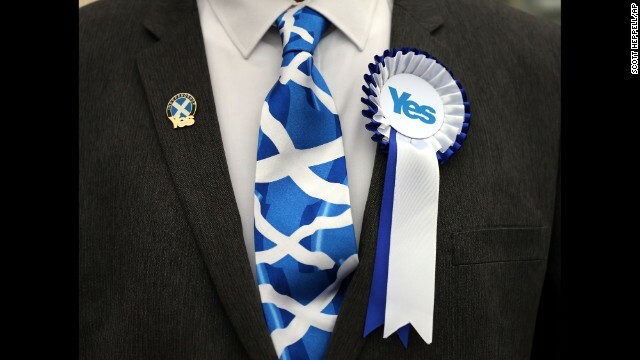 With 31 of 32 councils declared, the "No" campaign has won the referendum on Scottish independence. Scottish First Minister Alex Salmond admitted defeat in Scotland's independence referendum Friday -- and urged the rest of Scotland to do the same. In a televised statement, he thanked Scotland "for 1.6 million votes for Scottish independence. "A turnout of 86% is one of the highest in the democratic world for any such vote, he said. 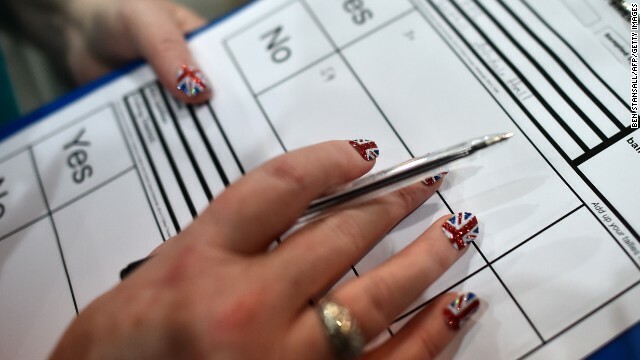 Voters in Scotland made their choice Thursday -- remain part of the United Kingdom, or form their own independent nation. They chose to remain. 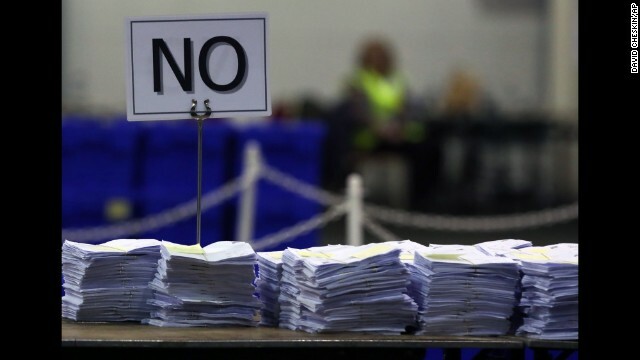 With 31 of 32 of councils reporting, the "No" campaign had garnered enough votes to secure their victory, and with it Scotland's continued place within the union. The first councils to declare all went to the "No" campaign, as did the capital, Edinburgh, which voted overwhelmingly to stay in the union with 123,927 for "Yes" and 194,628 "No" votes. Argyll and Bute and Aberdeenshire also voted "No." Glasgow delivered a solid win for the independence camp with 194,779 votes for "Yes," and 169,347 for "No," but lead was not big enough to overturn the "No" camp's overall majority so far, which maintains a 8% (54% to 46%) lead over pro-independence camp. The majority of the early results have been going the anti-independence camp's way. The "No" campaign extended lead with Angus and East Dunbartonshire council results, alongside a landslide in Dumfries and Galloway. The oil-rich city of Aberdeen also strongly voted for the unionist camp. The city of Dundee was the first big gain for the independence campaign, voting "Yes" with 53,620 votes for, 39,880 against. The individual counts by local authorities are ultimately immaterial as it is the total number of votes countrywide that will determine the outcome. 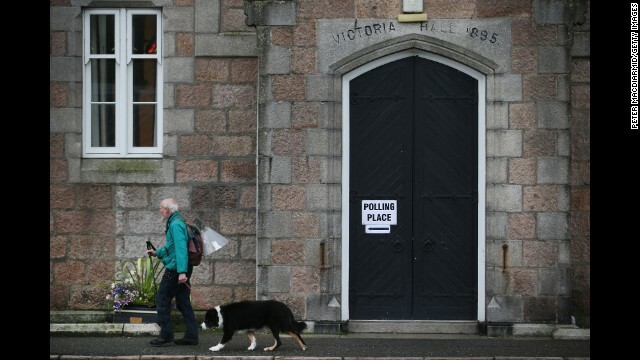 Polls at more than 5,500 stations across all districts, from the remote highlands and islands to the big cities of Edinburgh and Glasgow, closed at 10 p.m. local time (5 p.m. ET). People still in line to vote at that time were allowed to cast ballots. The first districts to report turnout reported high participation -- well over 80% in most cases -- Mary Pitcaithly, chief counting officer, announced in Edinburgh. Turnout in Glasgow, one of the Yes campaign's heartlands, was a relatively disappointing 75%. More than 4.2 million people registered to vote on the question: "Should Scotland be an independent country?" People opposed to Scottish independence celebrate the final results of a historic referendum Friday, September 19, in Edinburgh, Scotland. A majority of voters -- 55% to 45% -- rejected the possibility of Scotland breaking away from the United Kingdom and becoming an independent nation. 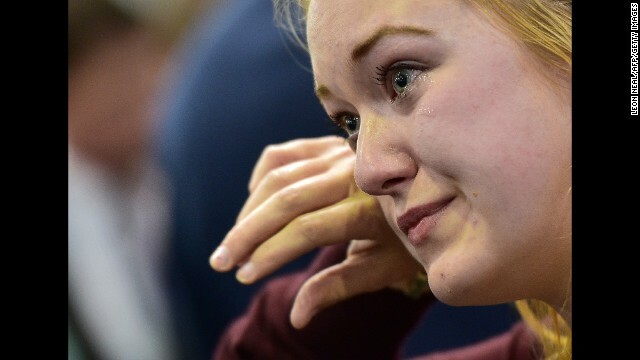 A supporter of an independent Scotland cries as referendum results are announced September 19 in Edinburgh. 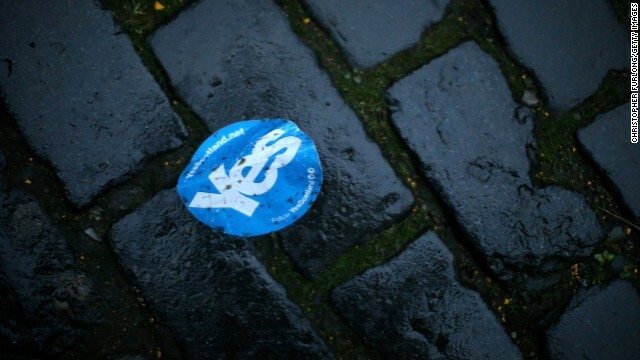 A discarded "Yes" sticker lies on cobblestones along Edinburgh's Royal Mile on September 19. 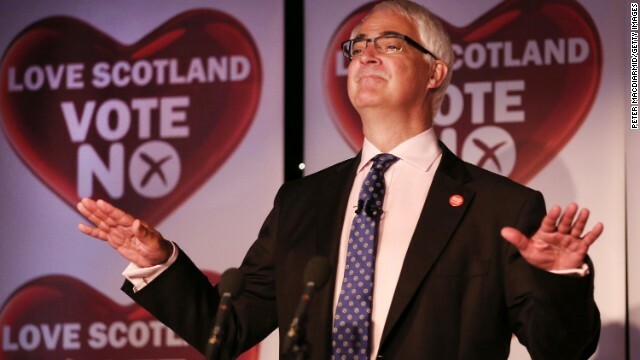 Alistair Darling, leader of the pro-union "Better Together" campaign, addresses supporters in Glasgow, Scotland, after the announcement of the referendum's final results September 19. 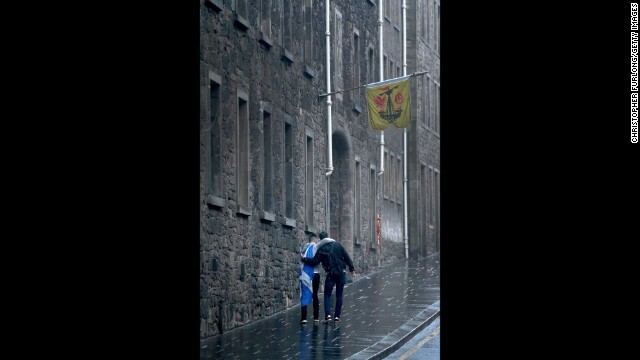 Dejected independence supporters make their way home in Edinburgh on September 19. 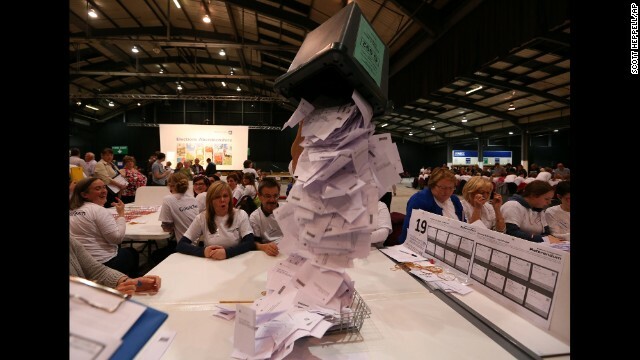 Ballots cast against Scottish independence get stacked on a table as votes are counted in Edinburgh on September 19. Ballot boxes are opened as counting begins Thursday, September 18, in Aberdeen, Scotland. 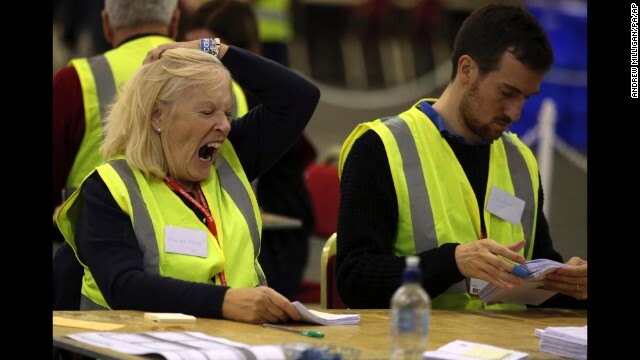 Ballot counting was tiring for staffers working through the night at the Royal Highland Centre in Edinburgh. Ballot papers are counted in Aberdeen after the polls closed on September 18. 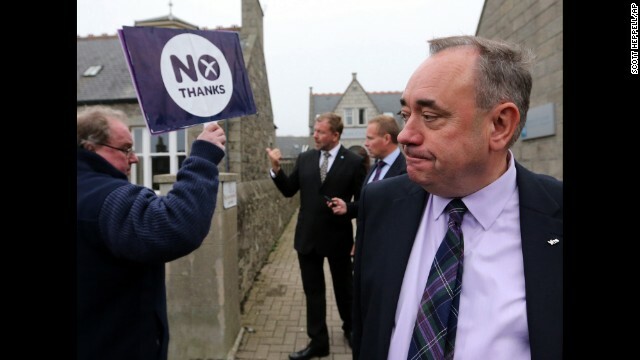 Scottish First Minister Alex Salmond passes an pro-union campaigner in Ellon, Scotland, on September 18. Salmond, leader of the independence movement, later accepted defeat and urged supporters to do the same. Campaigners on both sides of Scotland's independence referendum stand outside a polling station in Edinburgh on September 18. A man walks to a polling station to cast his vote in Ballater, Scotland, on September 18. 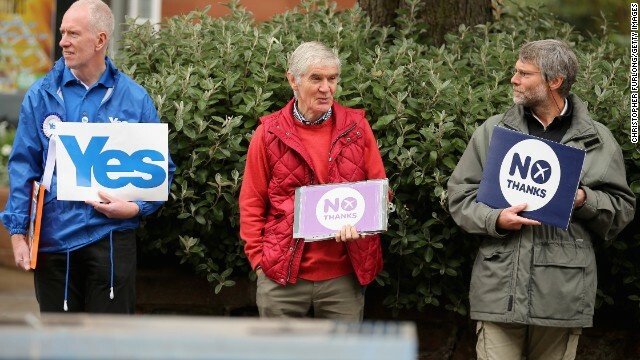 Campaigners stand outside a polling station in Edinburgh on September 18. 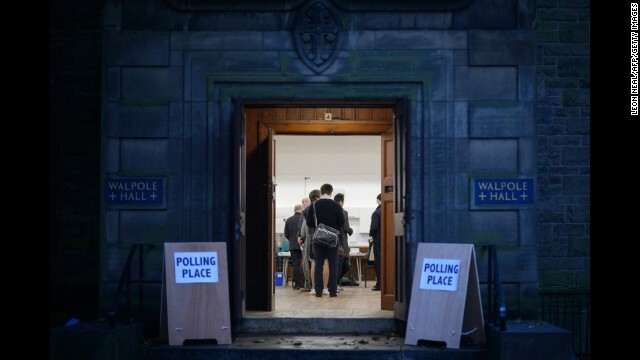 People wait to cast ballots inside a polling station in Edinburgh on September 18. 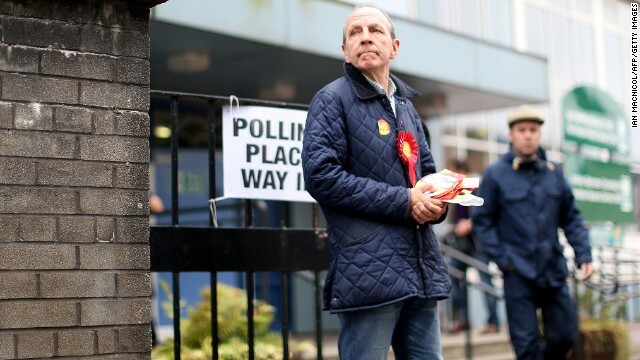 A voter arrives at a polling place September 18 in Edinburgh. 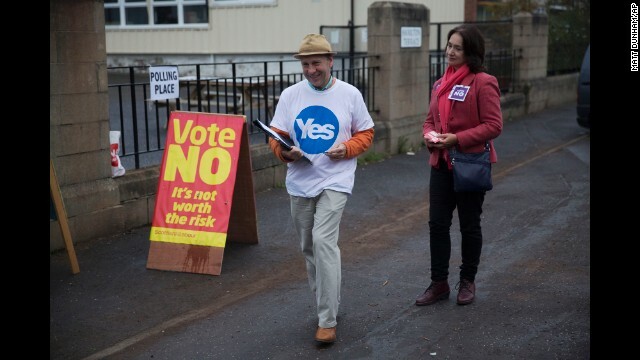 A pro-union campaigner distributes leaflets at a polling station in Glasgow on September 18. 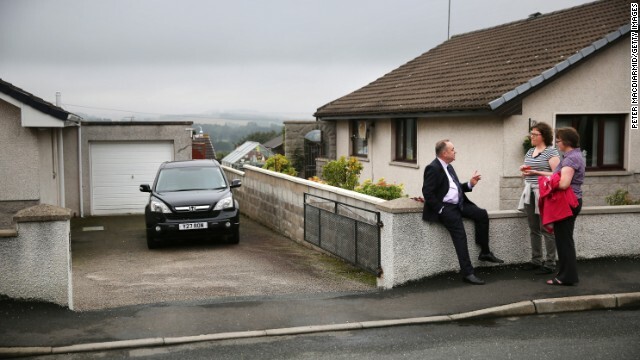 Salmond talks with supporters September 18 in Turriff, Scotland. 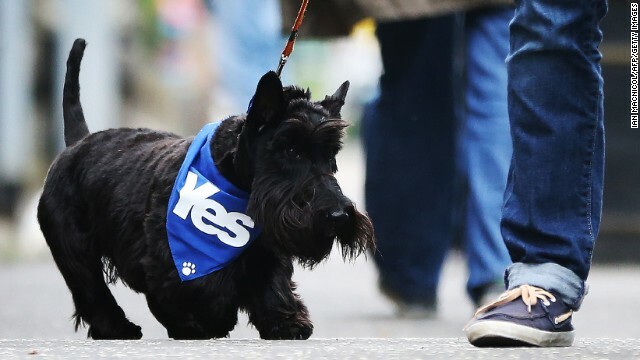 A dog wearing a pro-independence bandana walks down a street September 18 in Glasgow. 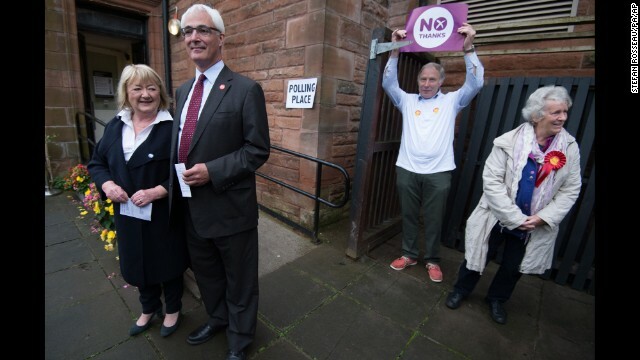 Darling, second from left, stands with his wife, Maggie, outside a polling station in Edinburgh on September 18. 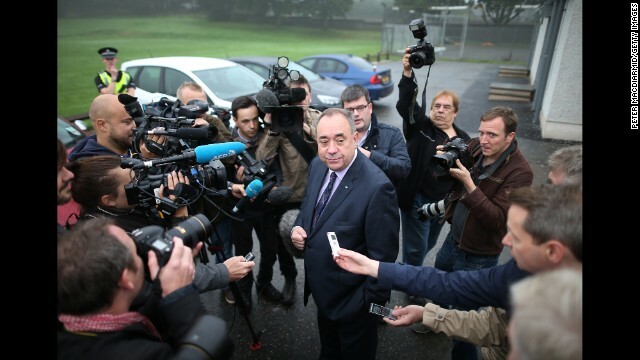 Salmond chats with reporters after casting his vote September 18 in Strichen, Scotland. A pro-independence campaigner displays his message September 18 in Strichen. 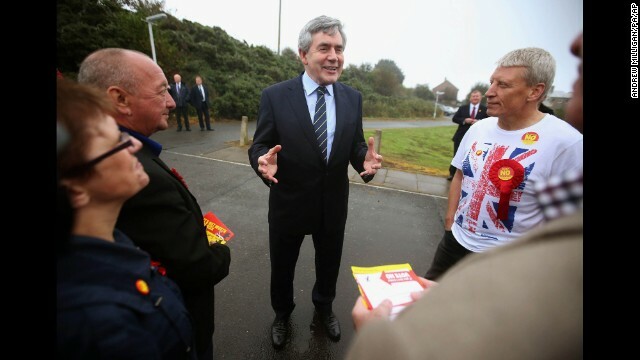 Former British Prime Minister Gordon Brown talks to pro-union campaigners outside a polling station in Queensferry, Scotland, on September 18. 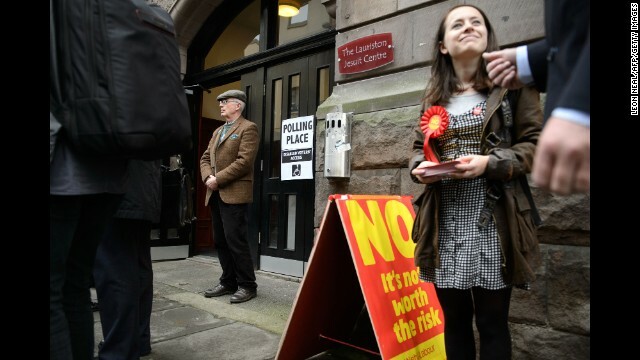 A young voter leaves a polling station September 18 in Edinburgh. Campaigners on both sides of the issue stand outside a polling station in Edinburgh on September 18. "The people of Scotland have engaged in this conversation," Phil MacHugh, a spokesman for the "Yes" camp, told CNN on Thursday night. "They have really gone out there, found out the information that they wanted to know, and made that choice today." The counting officer for Edinburgh, Sue Bruce, explained just after 10 p.m. that each ballot will be double-checked, to verify each voter's decision. Addressing dozens of election workers, Bruce added, "I look forward to working with you during the course of the evening to deliver an accurate and transparent Edinburgh count in which you and the voters of Edinburgh can have full confidence." Bad weather or the sheer volume of votes cast could slow down the counting process. However, the weather forecast appears good so far -- important when some ballot boxes must be collected by helicopter, plane or boat from polling stations on distant islands. Allegations of voting fraud were reported by Glasgow City Council, with several instances of people turning up at voting booths in Scotland's largest city to vote, only to be told that they had already voted. Scotland's First Minister Alex Salmond, who has led the pro-independence "Yes Scotland" campaign, cast his ballot Thursday morning in the village of Strichen, Aberdeenshire. Labour lawmaker Alistair Darling, who has headed the pro-union "Better Together" campaign -- backed by the main parties in Westminster -- voted in Edinburgh, while former Prime Minister Gordon Brown, another pro-union campaigner, voted in the town of Kirkcaldy. 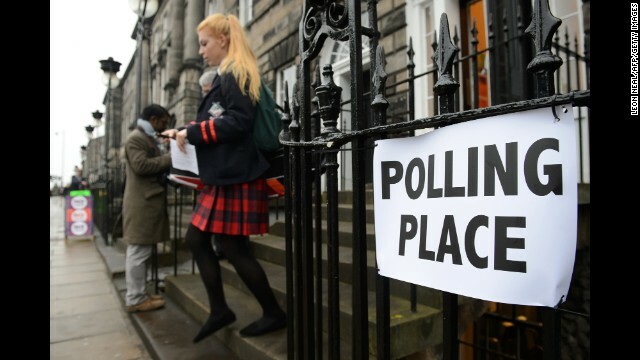 For the first time, the vote was extended to 16- and 17-year olds living in Scotland. Nearly 110,000 people younger than 18 have registered to vote. 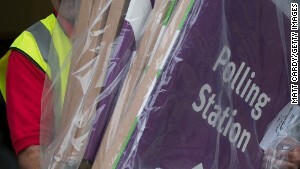 Nearly 790,000 people applied for a postal vote -- the largest volume of registration for postal votes ever in Scotland. After the polls closed, Salmond tweeted, "This has been a remarkable day. Scotland's future truly is in Scotland's hands." CNN's Nic Robertson reported from Glasgow, Laura Smith-Spark wrote and reported in London and Euan McKirdy wrote and reported in Hong Kong. CNN's Richard Allen Greene, Lindsay Isaac and Greg Botelho contributed to this report. Andrew Hammond: UK allies will breathe sigh of relief after Scotland rejects independence. First Minister of Scotland Alex Salmond gives his concession speech as Scotland rejects independence from the U.K.
David Cameron has had the narrowest of political escapes. 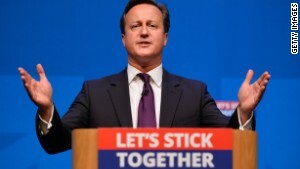 Success for the "Better Together" campaign has saved him from catastrophe. The Scots are talking a lot this week -- perhaps you've heard a little something about an independence referendum -- and that makes us happy. As Scots vote on independence, these are the advertisements they're seeing on TV. The country is not alone: From Belgium to China, separatists are looking to break away. Scotland by the numbers: 10 interesting facts you didn't know about the country. "I was immersed in green. Everything was green. And the air -- the air was crisp and clean and just seemed to have more oxygen in it." What's the deal with the UK? 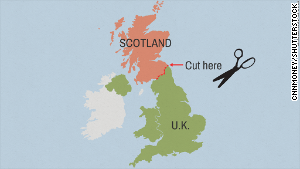 Scotland, England, the United Kingdom, Great Britain: How do they all fit together? When do you eat your tea? Is it driech outside? Test your Scottishness here.